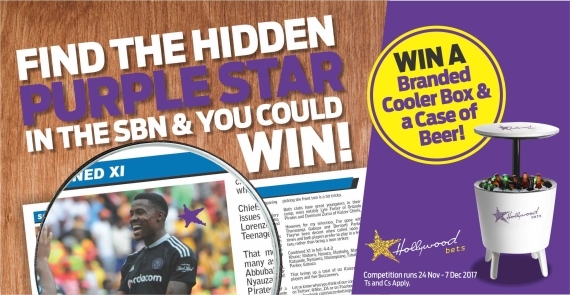 SBN - Soccer Betting News - SA's Leading Soccer Betting Newspaper: Stand A Chance To Win With Hollywoodbets! Stand A Chance To Win With Hollywoodbets! Buy the latest issue of Soccer Betting News for only R10 and enter Hollywoodbets' awesome competition where you can win a Branded Cooler Box & a Case of Beer! The competition runs between 24 November – 7 December 2017. Cut off time for SMS entries is 23h59 on 7 December 2017. Contestants must be over the age of 18 to participate in the competition. SMS “STAR”, your name and the number of horses in the star to 45294 to enter. SMS costs R1.00. In order for the entry to be counted as a valid SMS entry, the SMS must state the correct page number and the word Star. Entries per customer are not limited. Winner will be announced by Friday the 8 December 2017. The winner will be called on his/her Cellphone. If the contestant does not answer in 24 hours we will move to the runner up. Winner does not have to be present in order to claim the prize. The prize winnings are non-transferable. If contestants are unsure of the workings of the competition, they can contact promotions@hollywoodbets.net or helpline on 08600 42387. Should any dispute arise in relation to the interpretation of the Competition rules, Hollywoodbets decision shall be final and no correspondence shall be entered into. This competition is closed to any persons who are directors, members, partners, employees, agents or consultants of Hollywoodbets or any other person who directly or indirectly controls or is controlled by Hollywoodbets or marketing service providers, or spouses, life partners, business partners or immediate family members of all of the above. Winners must allow Hollywoodbets to use their name and photo in all associated press releases. Hollywoodbets reserves the right to cancel or withdraw this offer or change any of its terms and conditions at any time and without cause or notice. Hollywoodbets also reserves the right to disallow certain parties from taking part in the competition at its discretion. Every contestant participating in the promotion shall be deemed to have acknowledged and accepted the rules by virtue of their participation. This promotion is intended for recreational purposes, clients found to be abusing the spirit of the promotion will not be eligible for the prize.